Last week, someone in my VIP membership community asked about how to succeed in business. She bravely shared that she’d made zero Black Friday sales and was generally feeling completely defeated. She said she’s now second guessing every decision she makes, and she’s even beginning to think that maybe people just don’t like her. The post broke my heart … and it made me mad. I’m mad at the online “gurus” who contributed to her feelings. They clog our newsfeeds with “easy secrets” for five-figure launches and six-figure businesses and growing a massive following. They tell us they know how to succeed in business and make it seem oh-so-simple. Starting and running a successful, sustainable business is HARD WORK. Period. Are there unicorns who lucked their way to the top overnight? Sure. But for most of us, it takes time to craft clear messaging and create a solid offer. It takes time to build a following or a network of ideal clients. It takes time to nurture them and to get them to buy. It takes time to develop loyal clients who become repeat buyers. Want to know how to succeed in business? The answer is it takes time. I’m sick of people trying to sell the bill of goods that you can somehow skip ahead in line if you just learn their handy, dandy secrets. I’m even more sick that I’ve seen behind some of those curtains and now realize that many of these same people fail to tell you that their “7-figure business” is based on gross numbers and they actually clear something far less. Or that the “5-figure launch” they’re hyping cost $5,000 or more in Facebook ads. Or that their “overnight success” came because of a total fluke viral post or because they were an early adopter of a now-overrun social media channel. Very often, with a little digging, you discover the truth isn’t as simple as the promise. If you’ve ever done home repairs, you’ve probably heard “you can have it good, fast, or cheap — pick two.” The same is true with business.  You can build a financially successful business fast and cheap, but it will probably be a really crappy business (as in, one built on tricks or lies).  You can build a GOOD and financially successful business fast, but it won’t be cheap (as in, you’ll need to spend a lot of money on ads, lists, or professional help).  You can build a GOOD and financially successful business cheap, but it will take time (as in you, you’ll need to float that business while you DIY your way into clients). I’ve chosen Option 3 (good and cheap, not fast) both times I’ve built a business. The first time, I spent 6 months planting seeds for and saving money to float a freelance writing business while I was still working full-time. Then I spent another 6 or more months relying on my savings as I actually grew the business after leaving my 9 to 5. The second time, I spent 6 months laying the foundation for a coaching business while making 100% of my income from my writing business. This year, I began to make money from coaching but I’m still doing writing work to sustain myself financially. As I shared with my membership group, less than half of my income this year came from the work I really want to be doing (coaching, community, and courses). By the end of next year, I hope to be making almost all of my income from this new venture. That’s not glamorous, and it certainly isn’t the stuff of flashy Facebook ads. 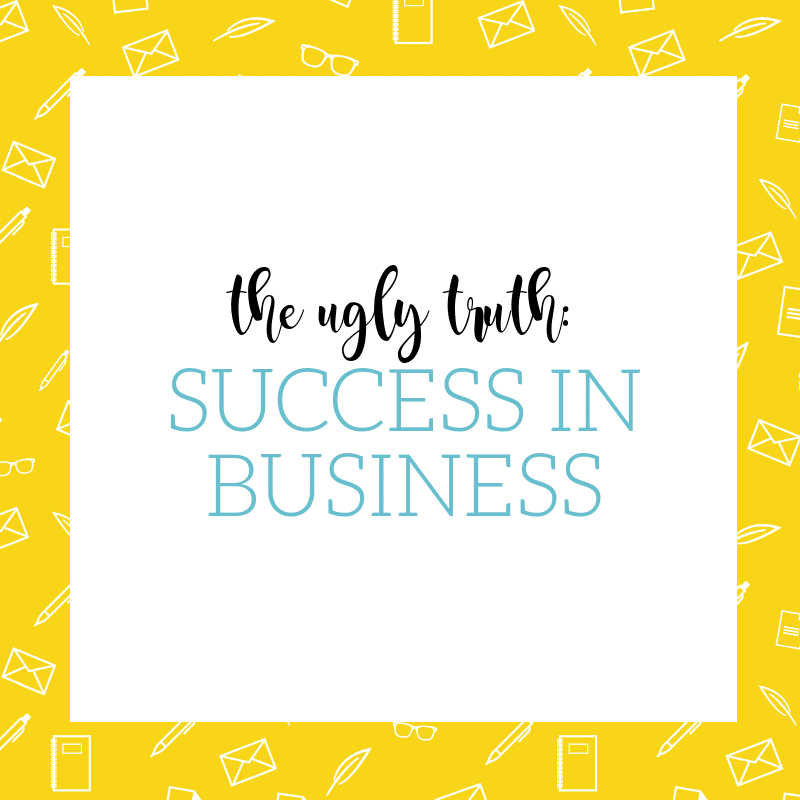 But it’s my truth, and the truth of so many other successful business owners I know. I want you to know you’re not alone. You’re not alone if, like the woman in my membership community, your business has you feeling exhausted and frustrated. You’re not alone if, like her, it’s taking more time and energy than expected to be successful. If you feel that way, take a deep breath and know it’s normal. Then, silence the voices that are adding to those feelings. They aren’t helping you and, more than likely, their “secrets” about how to succeed in business won’t either. Finally, find yourself a business community that is built on truth and support. Surround yourself with others who “get it” and who are willing to share the good, bad, and ugly of owning a business (not just the Instagram-worthy highlights). You can build the business of your dreams. You can get rich from your special gifts and talents. But if it takes you more than a few weeks or if the “3 secrets” don’t work for you, that doesn’t mean you’re a failure. It means you’re normal, and that’s okay. Good, fast, or cheap—which 2 are you choosing? Comment below and let me know! By far, this is one of the most realistic business success blogs I’ve ever read. I do agree that making my business successful takes time (if I chose option 3). Building a business needs to grow and it takes trial and error and finding the right techniques. I wanna share another secret to business success: Things might not go as I planned, so resilience in business should be a core principle. Staying strong in times of shortcomings, and turning problems and possible threats into opportunities shouldn’t be overlooked too. Learned a lot from this article. Thanks! May your businesses grow and prosper even more.